Support and Resistance define boundaries for rising and falling prices. Support: Support level is the price around which previously, a particular security/commodity finds incremental demand. Traders use this level to enter the stock. 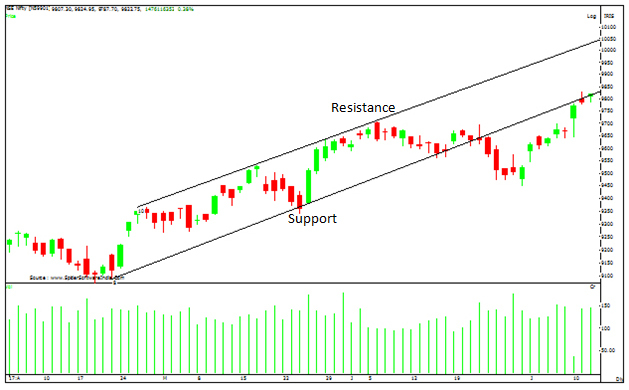 Resistance: Resistance level is a price around which a stock finds incremental sellers. Traders use these levels to exit a long position or even short sell a security. The oldest and easiest way of determining trend is with a "Trend Line." All that is required is two support points to draw an uptrend or two resistance points to draw a downtrend. A moving average is one of the most popular tool in a trader arsenal. It aids the trader to identify the true underlying trend. It is usually constructed using closing price of a stock eliminating the intra-day volatility. It is a trend following but a lagging indicator. For Eg: If prices move sharply in a direction up/down, the moving average follows prices with a lag i.e. It will take time to catch up. SMA assigns equal weighting to all values. 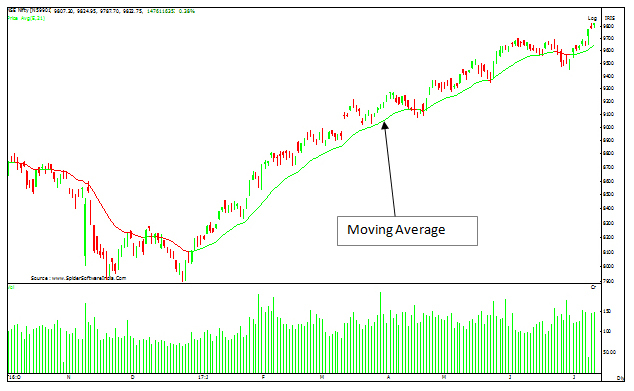 Eg:- To calculate 10-day simple moving average, simply add the closing prices of the last 10 days and divide by 10. EMA gives a higher weighting to recent prices. 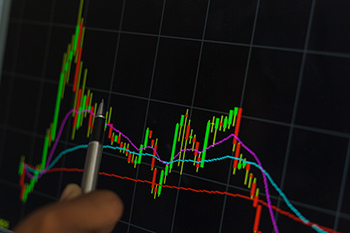 The EMA works by weighing the difference between the current period's price and the previous EMA, and adding the result to the previous EMA.